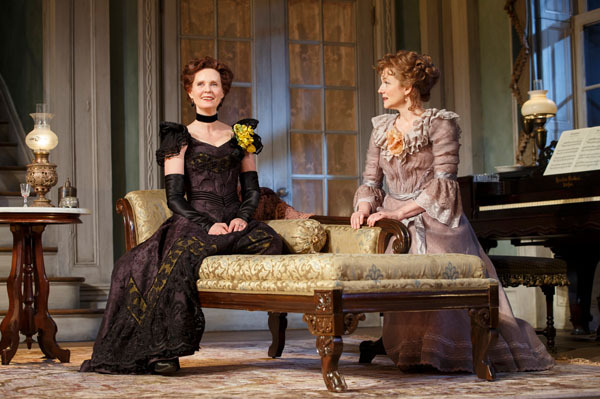 Actresses Cynthia Nixon and Laura Linney have turned the production of Lillian Hellman’s The Little Foxes on its head in this new adaptation directed by Tony Award winner Daniel Sullivan. Given that the two veteran actresses are powerhouses in their own right, they decided to split the lead role of Regina and supporting role of Birdie. Each night, the women take to the stage at the Samuel J. Friedman Theatre to alternate playing each role. All the while, the rest of the ensemble cast—including Darren Goldstein, Michael McKean, Richard Thomas, David Alford, Michael Benz, Francesca Carpanini, Caroline Stefanie Clay, and Charles Turner—are constantly kept on guard, reacting to different nuances in their singular performances. 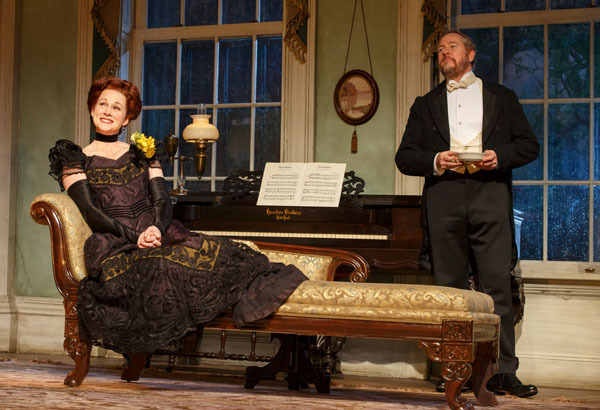 Laura Linney and Darren Goldstein in The Little Foxes. Photo by Joan Marcus. This powerful play itself, considered a dramatic classic in its own right, tackles the evergreen topics of greed, ambition and jealousy. Based in 1900s Alabama, the character of Regina Giddens portrays the head of her family clan, working in cahoots with her selfish brothers to coerce her dying husband to go in on a business deal of a lifetime. By having both Linney and Nixon switch roles, both actresses have the chance to take center stage in a powerful role such as Regina, but also allows each to explore the more subtle nuances of a quieter, gentler role such as Birdie, though while small, is utterly crucial to the development of the plot line of Little Foxes. 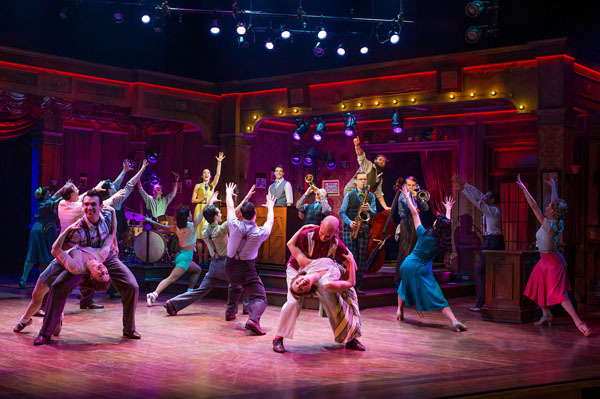 Broadway was in need of a big-band type of musical in recent years and the new production of Bandstand is ready to fill the void. This entertaining presentation, directed and choreographed by Tony Award winner Andy Blankenbuehler with music by Richard Oberacker, stars Laura Osnes, Coret Cott and Beth Leavel, who tell the story of a group of World War II veterans who join together to form a the Donny Nova band. The company of Bandstand. Photo by Jeremy Daniel. The ensemble, which also acquires a lead singer (played by Osnes) whose husband died in the war, sets out to create a song from a national radio contest to find America’s next big Swing band. The musical really hits its stride when the band begins to gel and we hear the struggles of WWII veterans reverberate through song. One of the breathtaking aspects of this production is the choreography that tells a unique story through dance. The ensemble has moments of pure joy when they celebrate the big band era and the fantastic musicality of swing, but they also portray sadness and loss in more poignant dance numbers where death and anguish is accurately depicted through dance. 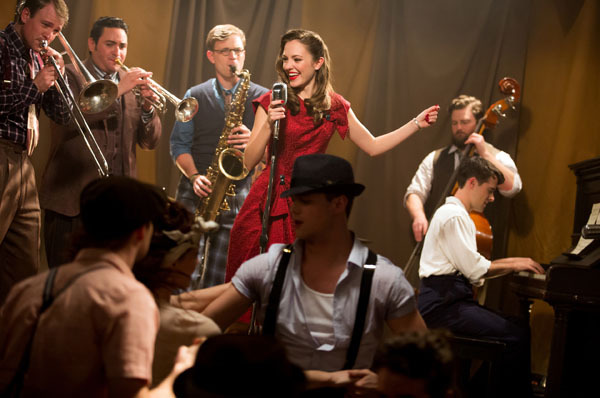 Tony Award nominee Laura Osnes and the cast of Bandstand. Photo by Jeremy Daniel. The plotline tugs at our heartstrings, and for any of us who have experienced any type of war and loss, it helps us celebrate the true resiliency of the American spirit.